What should we have for dinner? This book is a long and fairly involved answer to this seemingly simple question. "Today, buffeted by one food fad after another, America is suffering from what can only be described as a national eating disorder. Will it be fast food tonight, or something organic? Or perhaps something we grew ourselves? The question of what to have for dinner has confronted us since man discovered fire. But as Michael Pollan explains in this revolutionary book, how we answer it now, as the dawn of the twenty-first century, may determine our survival as a species. 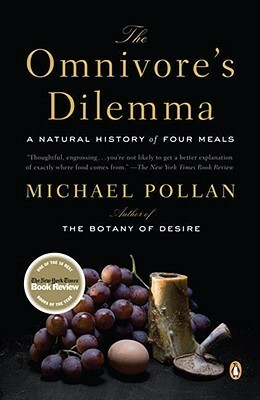 Packed with profound surprises, The Omnivore’s Dilemma is changing the way Americans thing about the politics, perils, and pleasures of eating." The Omnivore's Dilemma is a fascinating and disturbing look at the state of the modern food industry, and at the alternatives that exist. Pollan chronicles the rise of monoculture farming and the advent of corn as the base of industrial agriculture. He visits many places that are a part of this system and some places that are defying it. What he comes back with is a very sobering portrait, yet there is some hope too. Before reading this book, I'd seen "Food, Inc." and read about the topic in some other sources, but I still learned a great deal in The Omnivore's Dilemma. It provides a lot more information in certain areas than the film; Pollan actually explains a whole lot in a clear, concise, and fascinating way. He starts off discussing corn, and how a combination of lack of forethought, industrial muscle, and the need to feed everyone made farms in places like Iowa shift from growing many fruits and vegetables to growing one (or in some cases, two). It's quite frightening, particularly when most of the corn isn't actually going towards human consumption. Instead, it's fed to cows living in miserable conditions, where it wreaks havoc on their digestive systems. Cows are not meant to eat corn; for thousands of years they have co-evolved with grass, so that the two organisms both benefit from the transaction. Corn causes all sorts of harmful bacteria to develop in the cow's rumen. The industrial giants' solution? Give the cattle antibiotics, which due to their power and influence are not forbidden. You don't even want to know what else goes into the cow's diet; sometimes they're fed recycled beef tallow from the slaughtering plant, and all sorts of other unhealthy supplements are put into their feed to help them bulk up and not be too sick. When in reality grass is all they really need to eat, and they'll be healthy (and healthier for us too). It's ridiculous really, when you think about all the energy and manpower that's put into growing miles and miles of corn, and all the calories that are lost, when grass presumably doesn't take much energy on our part at all (although it does take a lot of calculation). Of course, there are counterarguments; corn certainly is cheaper and easier to feed to cows than grass, and there are a lot of people who need feeding. Similarly, many would say that grass-fed cows are unsustainable, which might be the case, but why would that really be? Grass and cows sustain each other in a relationship that goes back thousands and thousands of years, and the cows and the grass both are much healthier for it. We don't need to use manpower, fuel energy, or any of it to grow feed for the cows. I'm sure this is much simplified, but Pollan definitely makes a convincing case for a return to agricultural practices before the mid 20th century. He also spends a week living and working at Polyface Farms in Virginia, where the animals (cows, chickens, pigs, rabbits) eat what they're supposed to and lead relatively happy lives before the inevitably unhappy slaughter. I found this section quite interesting; while he kind of slips into idealizing this kind of farming, it's never completely so. After all, the chickens are still slaughtered, but before that everything is managed superbly, so that what would be waste is instead used to fuel the production of more grass or more resources. It's quite amazing, really, how the farmer, Joel Salatin takes advantage of the land and the animals. He's portrayed as a decent fellow, although something of a libertarian. But who can blame him? When it comes to food production, the government is under the thumb of the industry. Between the hellish feedlots and the idyllic Polyface Farm is the organic industry, which seems like it should be an oxymoron but isn't. Pollan also explores a new phenomenon, the "organic TV dinner", which is just ridiculous. This part of the system was the one I knew least about; it's not really covered in Food Inc, though both Polyface and the bottom barrel are. The fact is, organic companies don't actually care about the organic ideal or about treating animals better; they're just trying to exploit the current interest in organic food. Whole Foods is critiqued: "Lining the walls above the sumptuously stocked produce section in my Whole Foods are full-color photographs of local organic farmers accompanied by text blocks setting forth their farming philosophies. A handful of these farms...still sell their produce to Whole Foods, but most are long gone from the produce bins, if not yet the walls." It's also revealed that just because beef is organic doesn't mean the cows ate grass; instead they receive (organic) feed. And organic chicken does not mean free range; it just means that they must have "access to the outdoors" (an utterly meaningless phrase) at some point in their lives, usually the last two weeks before slaughter, by which time they're used to being inside and have no desire to venture into the little grass lot they're provided with. Pollan also forages his very own meal...this section was more light-hearted and very fun; I had a relating moment when he talks about chanterelle foraging (the one mushroom I can identify), and I enjoyed his description of the agonies of abalone gathering and the trials of hunting. The meal he makes sounds mouthwatering. One criticism that I have of the book in general is that it's definitely directly focused on affluent people, people who can afford to buy high quality meat and produce and not processed foods. That's another tragedy, that the foods that are so terrible for us are so much cheaper. But I suppose this is another issue; The Omnivore's Dilemma basically looks at the ethics of it all, and the industry behind it. I'm currently reading his book In Defense of Food, which more discusses what exactly we should eat. The Omnivore's Dilemma is an engrossing look at the dark side of the modern food industry and the problems that bedevil it, with no clear solution in sight. However, at least these days there are alternatives. The writing here is really accessible; the book isn't too difficult to understand, yet Pollan writes complexly about complex issues. I raced through the book; despite its length and weighty subject matter, it's really compelling, and I learned so much.